A call for all-Syria talks in Moscow sounds like the panacea likely to break the impasse in ongoing UN talks on Syria. She says SNC leader Burhan Ghalioun told her in an exclusive interview to be released tomorrow, Friday, “If Russia is prepared to let the Security Council resolution pass by withholding its veto, there could be some rounds of negotiations in Moscow on the transfer of power as specified in the Arab initiative… We have no problem with the venue” so long as it leads to the transfer of power. Russia’s UN envoy to Vitaly Churkin Tuesday urged the parties to the Syrian conflict to start dialogue. 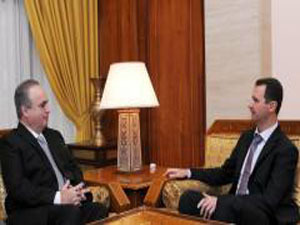 He said his country invited “the Syrian authorities and all opposition groups [to send their representatives to Moscow within mutually acceptable time periods to hold informal contacts without preconditions. A day earlier, the Russian foreign ministry said, "Our offer has already received a positive response from the Syrian authorities." But Ghalioun rejected the offer, telling AFP President Bashar al-Assad’s “resignation is the condition for any negotiation on the transition to a democratic government in Syria." The foreign ministry said talks in Moscow were "acutely necessary for the immediate cessation of all violence in Syria and preventing a bloody split in society." They would also help ensure the "success for profound democratic changes in the country, in keeping with the aspirations of all Syrians." Russia said its offer to host talks was aimed at ending the crisis "through a peaceful mechanism worked out by the Syrians themselves, without international interference."